In many ways, the story of Quad Cycles is the story of Rustem Gode. As owner of Quad Cycles, Rustem ensures that his store offers top quality equipment and repairs combined with professional cycling advice. Rustem’s passion for cycling began as a child where early on he jumped into the world of racing and bicycle maintenance. As his love for the sport grew he found himself a job as a mechanic for the Turkish International Racing Team. Working for a professional crew, he quickly developed his skills, and before long he was promoted to chief mechanic of the Turkish team. He traveled widely and he grew to understand and appreciate cycling in many other countries. 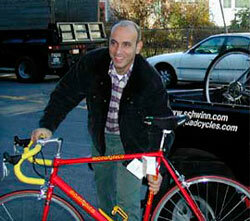 Rustem moved to the United States in 1989 and worked as a bike shop manager in the Cambridge area. In 1996 he and a childhood friend opened a new bike shop there. Shortly after that he bought a home in Arlington and immediately fell in love with the community. He sold his share of the Cambridge bike shop and opened Quad Cycles in April of 2000. When young children come to Quad, Rustem’s eyes light up. He loves their pure passion and excitement. In partnership with the Arlington Bicycle Club and Quad Cycles racing team, Rustem hosts maintenance and safety classes to help kids get the most out of their cycling experience. Rustem is from the “old school” of cycling. He loves it when people to come into the shop not only to buy, but to hang out as part of an open cycling community. At any given time you may find one or more cyclists sitting at the back counter reading a magazine or having a cup of coffee. You’ll meet members of the racing team riding trainers or talking shop just because they like being here. Come down to the store and meet Rustem, and some of the interesting and enthusiastic staff he has collected. Have some coffee and chat. You will leave feeling that you got exactly what you needed—even if you didn’t buy a thing. Justin started working on bicycles when he was 6 years old and decided to see how his own bike worked, and he hasn’t stopped since. He’s been at the shop since August 2012, but before that, he volunteered at the Boston Cyclists Union and Bikes Not Bombs, providing free tune-ups and other services for both non-profits (and friends of the shop!). He was also a ride leader for the Charles River Wheelmen, and knows more than his fair share of cycling routes throughout the greater Boston area. If you need a quick flat fix, a major overhaul, or anything else involving wrenches and impeccable mechanical knowledge and skills, Justin’s thrilled to help. Byron began working at Quad Cycles at the beginning of 2016. He grew up in Hollis, NH and moved to the Boston area in 2002 after meeting his wife while they were both racing in the Green Mountain Stage Race in VT. An avid cyclist for as long as he can remember, Byron grew up in a very active family who all shared a passion for riding. They commuted by bike long before it became trendy, and spent vacations bike camping in places like Nova Scotia, Canada. Byron raced BMX all over New England as a young teenager. Later, he was an amateur road and cyclocross racer in races all over the country for over 20 years where he earned many state titles in Massachusetts and New Hampshire. Byron’s wife is a two-time Elite Canadian Cyclocross National Champion and was a Canada team member in the 2003 Cyclocross World Championship. They both still ride frequently, but now leave the competitive stuff to their 12 year old son who, when not embracing his Canadian roots by playing hockey, has raced two seasons of cyclocross.